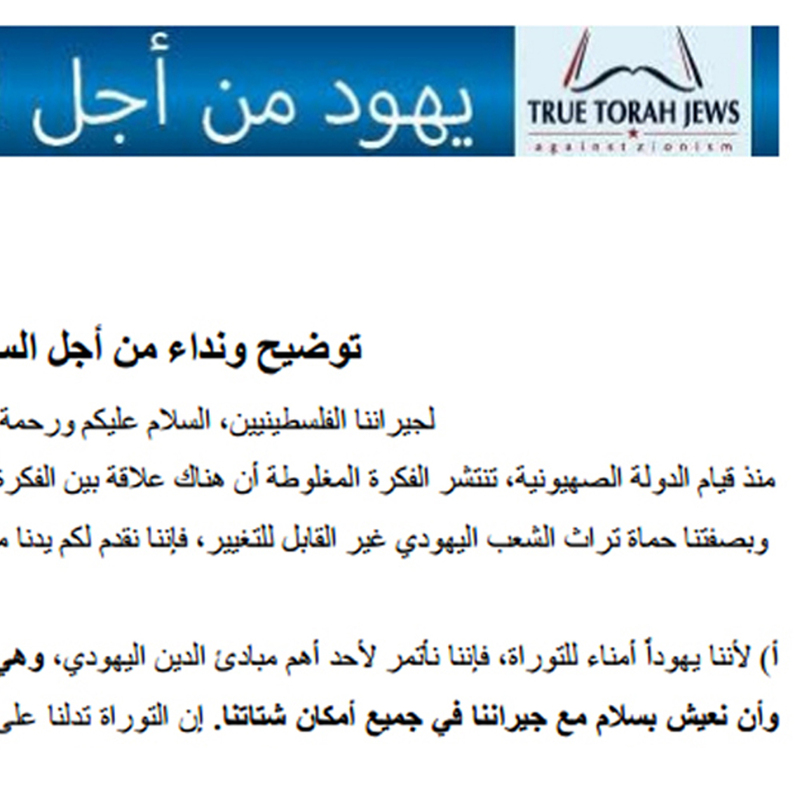 In light of the tensions surrounding the Temple Mount question and the increasing terror attacks, the True Torah Jews organization has embarked on a massive campaign in the Palestinian media to differentiate between Judaism and Zionism, while issuing a call for peace. True Torah Jews published the following message of peace as a full-page ad in the Tuesday, November 24, 2015 print edition of Al Quds, the largest Palestinian newspaper, based in East Jerusalem. A banner was also placed on the Al Quds website, linking to the full ad. With the founding of the State of Israel came the widespread misconception that there is a connection between nationalistic Zionism and the Jewish People. As the torch-bearers of uncompromised Jewish heritage and tradition, we find it opportune to reach out to you and clarify the following matters. A. As one of the foundations of Judaism, Jews are obliged to be loyal to the governments under which they find shelter, and to live peacefully with their neighbors in every country where they may be dispersed. The Torah teaches us to live peacefully, “The ways of the Torah are pleasant and all its paths [call for] peace.” Accordingly, for close to two thousand years, Jews have lived this way in every country in the Diaspora. B. Therefore, the relationship between the Arab and Jewish nations has always been one of peace and fraternity; friendship reigned between both nations at all times. In fact, for hundreds of years, hundreds of thousands of Jews lived in almost every Arab country with mutual respect and honor. Even the Jews who continued to reside in the Holy Land for generations lived with friendship and brotherliness with the Palestinians. They engaged in business together, they helped each other, and they even attended each other’s celebrations. C.	About one hundred years ago, the idea of Zionism was tragically conceived. Its malicious intent: to turn authentic Torah Judaism into a new-fangled culture of nationalism and rebellion, directly contradicting the Torah. Immediately upon its founding, Jewish leaders and rabbis protested forcefully against its ideas. D.	With incredible chutzpah, Zionists added insult to injury by effectively “stealing” the identity of the Jewish People. They continually declared themselves as representatives of the Jewish Nation, when the opposite is true. Judaism is a religion which is guided by the Torah, as opposed to Zionism which is a political movement that contradicts the Torah. Leaders and/or supporters of Zionism do not represent Judaism and/or the Jewish People under any circumstance. E.	Zionism is the greatest tragedy that has struck the Jewish People. We have suffered most from Zionism because it exploits innocent Jews as cannon-fodder to advance its agendas. Zionist groups and organizations even neglected to rescue Jews during the Holocaust in their hopes of promoting the country’s independence through increased Jewish holocaust fatalities. Unfortunately, the confusion between “Judaism” and “Zionism” resulted in the loss of lives and livelihoods of so many Jews who had prospered in Arabic countries for generations. And the Holy Land, where Jews and Arabs had lived so peacefully that they would babysit each other's children, has turned into a minefield of hatred and conflict. F.	Orthodox Jewry has declared, and continues to declare, that Zionists do not represent the Jewish People. Therefore, the statements of Zionist leaders and spokespeople, their declarations, and their actions do not have any connection to the Jewish People. Unfortunately, we hardly have a platform from which to voice the truth, as it is strangled and silenced by the Zionist leadership. a. Since the destruction of the Temple, Jews have been forbidden to set foot on the Temple Mount. The status quo of Judaism for the past two thousand years has been to completely prohibit ascending the Temple Mount. This prohibition was reiterated this year by every authentic Jewish Rabbi and Rabbinical Court without exception. b. Specifically in these times, when ascending the Temple Mount results in conflict, we are forbidden from setting foot on the Temple Mount per another commandment of the Torah, which obliges us to behave in pleasant, peaceful ways. H.	Orthodox Jews have recently exerted much effort in holding back individuals who planned to ascend the Temple Mount. To a great extent, they were successful, and many Jews who visited the Temple Mount in the past have ceased this practice. The hope is to continue keeping people away from the Temple Mount as much as possible. I. We stretch our hands out to you in peace, and we once again declare that we wish to live with friendship and fraternity with our Arabic neighbors and the Palestinians as we did in the past. We pray to G-d that we may reach a peaceful agreement with mutual understanding, without any loss of human lives – neither Palestinian or Jewish – at all. Every human casualty is a tragedy. Every human being was created by G-d, and the Torah commands us to treat him or her with respect, without regard to his or her nationality, type, or background. Click here to view the ad in Arabic on Al Quds website. Click here to view a scan of the actual newspaper. Click here to read the ad in Hebrew translation. Click here to read the ad in Spanish. “We are writing to you regarding the important work you do in publicizing to the world the position of faithful Jewry: that as observant Jews, we are commanded not to provoke the nations of the world and not to attain sovereignty before the time of the redemption of the messiah. The issue at hand right now is the need to publicize in all places that religious Jews have no interest or reason to enter the Temple Mount (Haram el-Sharif), and on the contrary, it is a severe prohibition to do so. Already in 1867 the greatest rabbis of the time placed a severe ban on entrance, and in 1967 our rabbinical court published the prohibition. We today have reiterated this ruling many times. How much greater is the need to speak out today, when people wearing religious garb, who pretend to be observant Jews, enter the Temple Mount. This has been a cause for violence, as non-Jews erroneously think that religious Jews are part of this offense. Therefore it must be especially publicized today, and the strong winds of false nationalism blowing today must be stopped. Perhaps in this way there will be an end to the bloodshed, which has increased lately, to our great sorrow. If only peace could be restored to the Holy City and the Holy Land, this would be your reward. Click here to view the Eidah letter. A spokesman for TTJ notes that the ad is written in a similar fashion to the letter published by the great Rabbi Yosef Chaim Sonnenfeld, in the wake of the 1929 attacks, titled “Words of Peace and Truth.” He stated that Haredi Jewry is opposed to anyone that ascends to the Temple Mount, and that Jews have no wish to fight with the Arabs, but rather wish to live in peace. Click here to view Rabbi Sonnenfeld's entire letter, with links to the original. Listen to Rabbi Yaakov Shapiro discussing the ad with Talkline host Zev Brenner on WMCA New York 570 AM. Download the clip of Rabbi Yaakov Shapiro discussing the ad with Talkline host Zev Brenner on WMCA New York 570 AM. Read coverage of the ad campaign on jpudates.com.